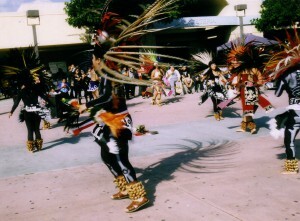 Azteca Dancers dressed in colorful feathers and black and white regalia blessed the event and celebrated at the Day of the Dead festival held at San Gabriel High School on November 5. 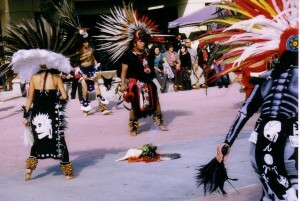 The dancers moved to the beat of ceremonial drums as they honored their loved one. 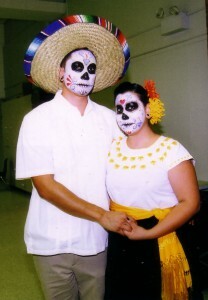 Several of the dancers were dressed as skeletons in honor of the day. The schoolyard had several booths selling art, clothing and crafts as well as henna decorating and face paintings. Several student groups in the auditorium performed various traditional and popular songs. At the doorway a stall featured pictures and poems created by the students were available for the public to enjoy. 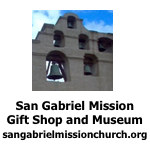 Children of all ages were busy making paper flowers, decorating sugar skulls, decorating fans and making the “Eye of God” with colorful yard and wooden sticks in the form of crosses. Jesse Escoto and Rosaria Almader shared the history of November 2, which is called “All Souls Day”. This is their Halloween. They remember their loved one with colorful altars decorated with marigolds with brings the dead to see the light. They place pictures, candles, flowers, mementoes, and special foods and drinks that their loved one enjoyed in the lives on earth. 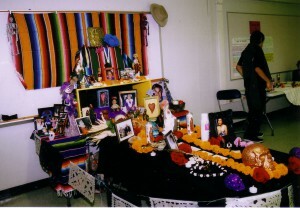 This altar was created for the Sureyor, Almader, Calderon and Jimenez families. This “Day of the Dead” festival offered the residents of the San Gabriel Valley a chance to share in the Latino culture as families enjoyed this special day to honor their loved ones who have gone before them.